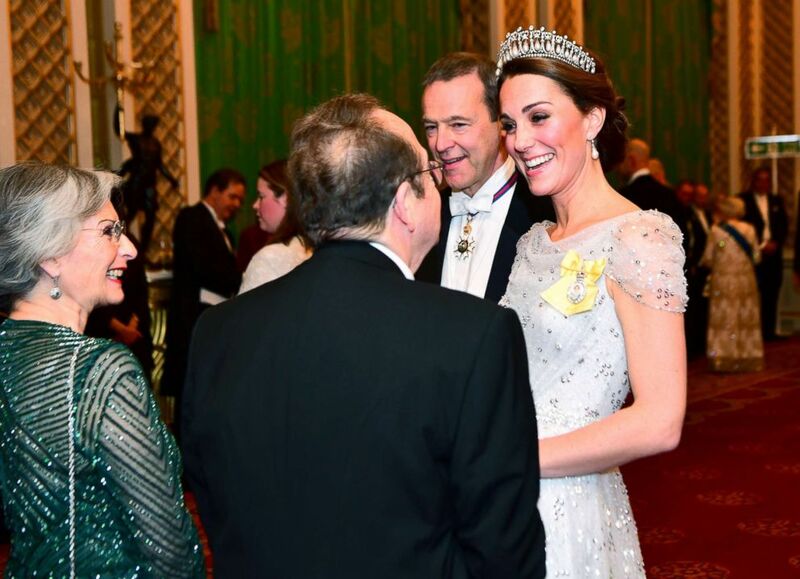 Kate, the Duchess of Cambridge, attended the annual Diplomatic Reception. 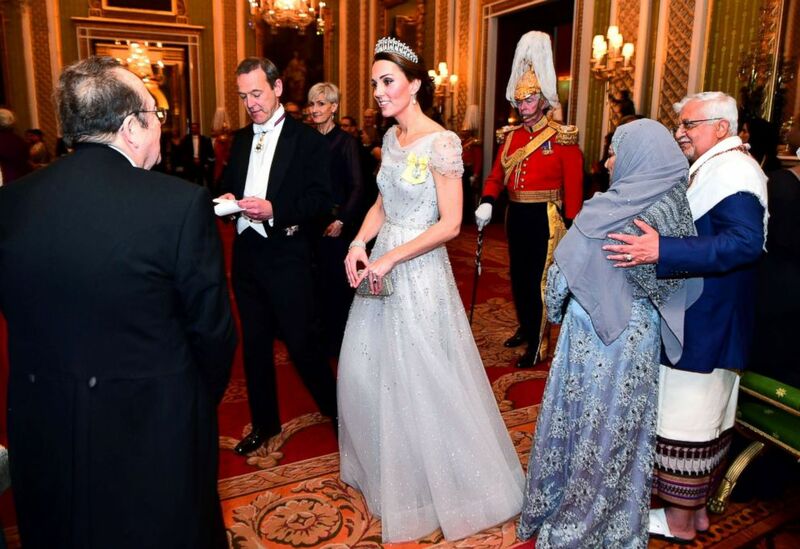 Kate Middleton, the Duchess of Cambridge, dressed in a sequin gown and dazzling tiara, brought full royal glamour to a white-tie reception at Buckingham Palace. Kate, 36, wore the Cambridge Lover’s Knot tiara, a favorite of Princess Diana’s, to the annual Diplomatic Reception Tuesday night. 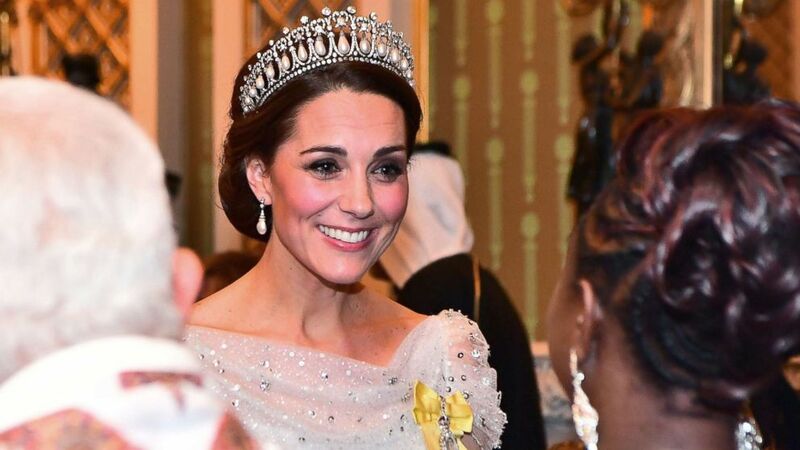 The tiara, which Kate also wore to a state banquet in October, was created by Queen Elizabeth's grandmother, Queen Mary, in 1913, and was also seen on Prince William's mother, the late Princess Diana of Wales. (Victoria Jones/Pool via Reuters) Britain's Catherine, The Duchess of Cambridge, talks to guests at an evening reception for members of the Diplomatic Corps at Buckingham Palace in London, Dec. 4, 2018. Kate paired the tiara with a glittering off-white gown embellished with sequins by designer Jenny Packham. Murphy noted that it had been a “busy day” for the Cambridges, who earlier in the day hosted a party for families of deployed personnel from Royal Air Force (RAF) Coningsby and RAF Marham, who are serving in Cyprus. According to Murphy, who attended the event, it was a very relaxed and fun occasion with the Cambridges in festive spirits. Meghan and Harry, the Duke and Duchess of Sussex, wed in May. William and Kate hosted a party for families of deployed personnel. Princess Kate has worn a black velvet bow at two of her most recent appearances. The Duke and Duchess of Cambridge walked through a blizzard of fake snow as they arrived at the Kensington Palace event. Kate, who looked festive in a plaid skirt by Emilia Wickstead, delivered a speech at the party in which she thanked the military families for their service. On Wednesday, the morning after the Diplomatic Reception, William and Kate touched down in Cyprus to meet with Royal Air Force service members, their families who live on base and members of the local community. “William and Kate are playing Santa at Christmas” Murphy joked, explaining that the Duke and Duchess of Cambridge are delivering presents and cards they collected at the party on Tuesday from family and friends of the personnel serving in Cyprus.